My barometric pressure sensor came in today. I posted about ordering it a short while ago because the shipping costs at Adafruit (my preference) were too cotton-pickin' high, and man, I was totally surprised when it came in today. The other thing that surprised me was how small this thing is. Sure, the pictures compare it to a coin and that should give a person a good idea how small it is, but when you unwrap it and have to actually look around to find it inside the shipping envelope, it comes home full force. This thing, breakout board and all, is tiny. Notice how small it is compared to the Arduino? That means I have some choices in exactly how I implement the final installation. Another thing that surprised me was how incredibly easy it was to implement the code to read both temperature and pressure from the device. Yes, I was standing on the shoulders of giants that have trod before me, but that's what open source is all about. First, I grabbed the Adafruit Unified Sensor Driver and tried it out. I had compile errors in the examples supplied. Frankly, that was annoying since I've never encountered that before at Adafruit, so I grabbed their older, deprecated, version 1 library specifically for the BMP-085 and tried it. So, fine, I'll just use the older library because it was getting late and I really don't want to hunt down some big company's compile error. A deprecated library that works is perfectly OK with me. Of course I made a few changes to the example because it gives the pressure in Pascals and the temperature in Celcius, I wanted mBar and Fahrenheit. I also want the string I use to be a JSON string when I send it over an XBee to my Raspberry Pi. I still have a bunch of work to do with this device, I have to hook it to an XBee, and install it into my Stephenson Screen out on the fence. That will require waiting for the XBee shield I ordered for this project to come in. I intend to put an Arduino, the shield, the XBee and this new BMP-085 all out on the fence in the weather and see what happens over time. So expect at least one more post on this part of the project. These days a basic Arduino clone can be bought for less than $10, an XBee shield for about the same and the BMP-085 for a few more dollars. The accuracy on these things is quite good, and if necessary over time, calibration is a simple code change. Nice project for a beginning weather buff that wants to go digital. 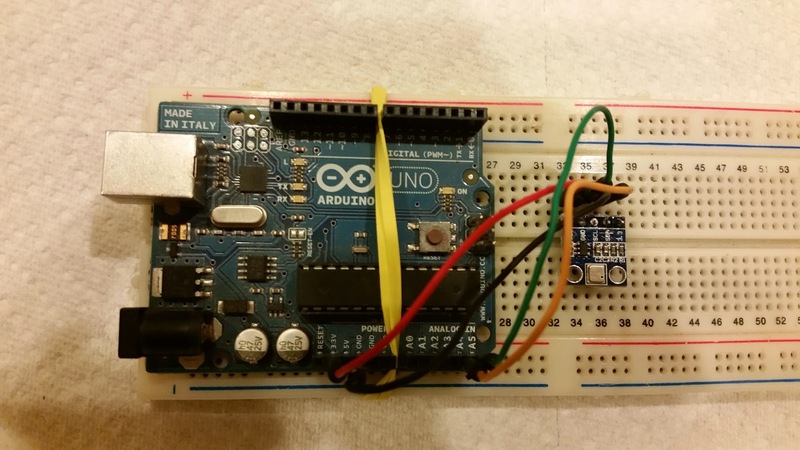 Ok, so with reference to the picture, I was wondering if the yellow item around the arduino board is a JSON string? Cool little project. Love it when they are quick to implement. Another good tool for environmental measurement.